Boy's Harnesses from WagPetGear - Wag Pet Gear! Stripes, stripes, stripes everywhere! This harness has blue, brown, white, red and tan stripes. The trim down the back is white with brown doggie paws. It is trimmed in navy blue. 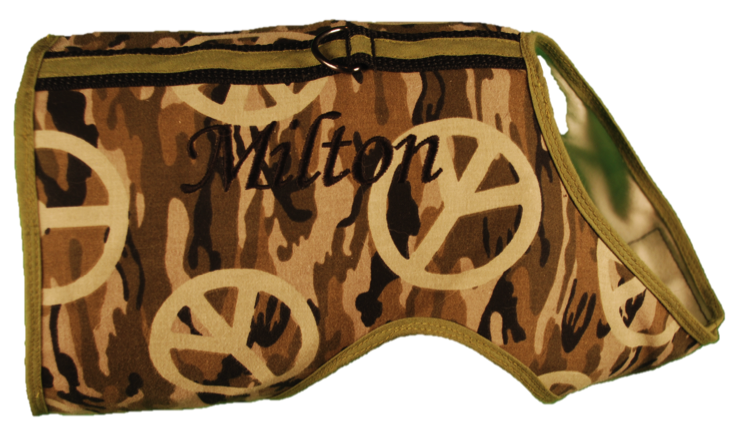 To bring out the hippy in your dog, this blue harness has a tie-dye look to it with faded peace signs scattered on the harness. It is trimmed in navy blue. 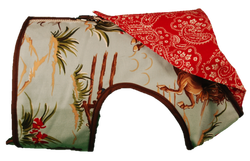 This brightly colored harness will have your pet ready for the beach. 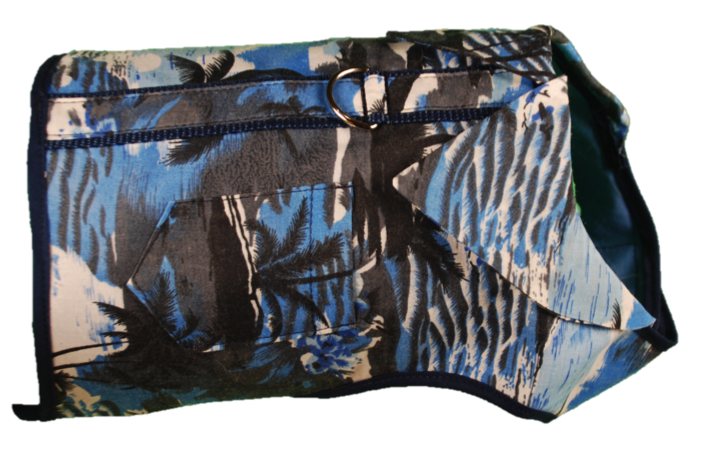 It is a bright blue and white Hawaiian print with orange trim. It has a collar and a pocket. This harness will put spring in your dog's step. It is a pastel blue, white and tan argyle with solid light blue down the back. It is trimmed in white. Perfect for any boy who loves to dress up like a pirate, this harness has a black background with pirate skulls and swords. It is trimmed in red. This harness will bring out your pet's inner tough guy! It is a black background with orange, yellow and red flames. It is trimmed in red and lined with orange. This bright blue harness is covered with brightly colored dinosaurs. It is trimmed in turquoise and has orange lining. 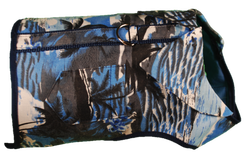 The blue Hawaiian harness has a blue tropical print on the body. 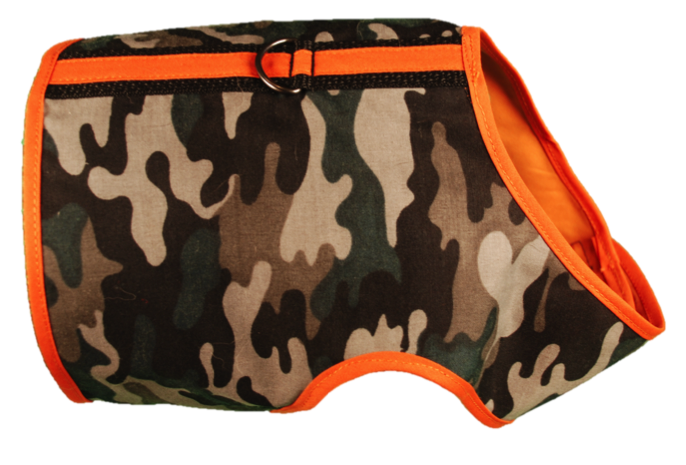 There is also a collar and a pocket so your pet can carry his own waste disposal bag! This harness is for the hunter in your family. 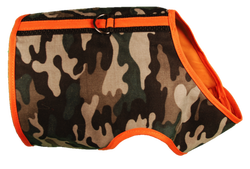 It is black and gray camouflage fabric with orange trim and lining. 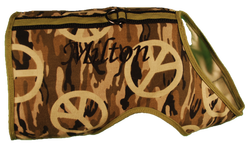 For the promoter of peace and happiness, this harness has an olive green and black camouflage background with light green peace signs. 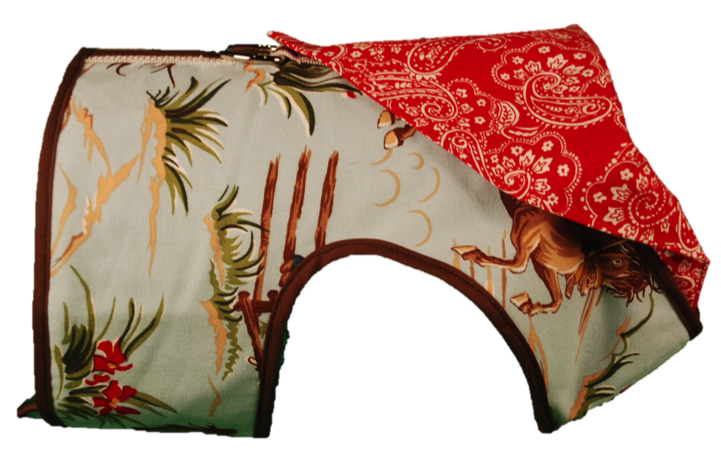 This harness coordinates with the Cowgirl Harness and the Cowboy Leash. The body is light blue with a cowboy print and it has an attached red bandana. 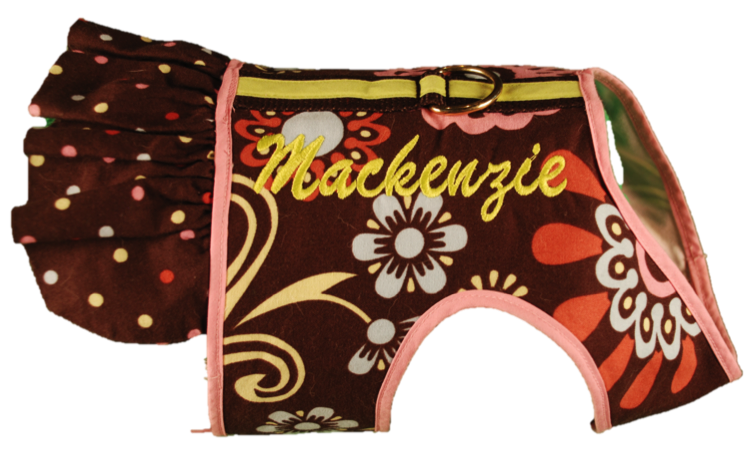 Not just for dachshunds, this harness has a black background with wiener dogs wearing brightly colored sweaters. It is trimmed in yellow.